Store, transfer and share 32GB of your favorite photos, videos, music and more with Kingston’s DataTraveler SE9 G2 USB Flash drive. Its stylish, capless design means there’s no cap to lose, and its ultrasmall form factor fits any lifestyle. 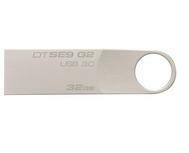 DataTraveler SE9 G2 now offers fast USB 3.0 speeds to save time when transferring, sharing or storing files. Its durable, top-selling metal casing design and sturdy key ring can be customized by adding your logo and/or digital files to promote your organization or brand.